Ohio Queers: Columbus couple featured in groundbreaking photo book ‘Gay in America’ – RELEASED TUESDAY! 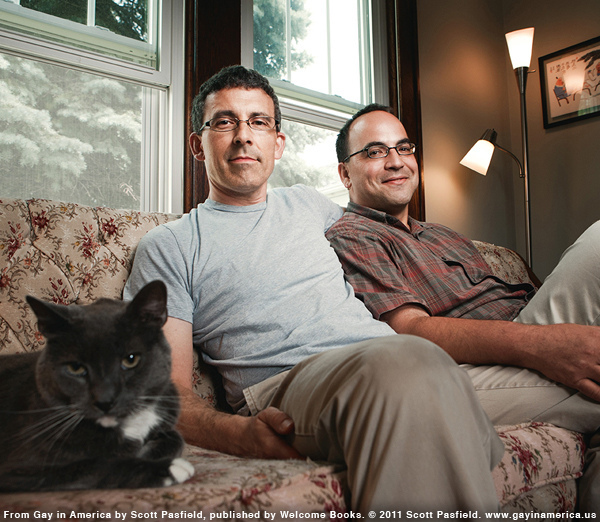 Columbus natives Jonathan and Paul are featured in the the portrait book “Gay in America” by Scott Pasfield that’s being released nationally tomorrow. Aaron McQuade: Where did the idea for this book come from? Scott Pasfield: People always tell you to shoot what you love. You have to start with yourself. The epiphany came one night at home. I was surfing the web and realized what a powerful tool it had become for connecting gay men across the country, from all over, and it just dawned on me. I decided that I would meet men from every state, and photograph them in the hopes that I could do a book that would change opinions and educate. And that started with shooting who I was and what my passions were. SP: That goes back to shooting what I am, and what I know. I originally thought that I would like to try and shoot men and women from every state, but I really think that a woman, or a lesbian, has to go out and do that project, to make it as strong, to be one of them, as this project is for me and gay men. I tried at first, but it became obvious terribly fast that I would’ve had to masquerade as a lesbian to do the same project. AM Would a book like this have made a difference to your own coming out story?SP: Absolutely. I wish there was a book like this when I was growing up and that is why I did it, really. I wanted to know that I could live wherever I chose, in any place, in any state, in any situation, in any city, in any town, and do whatever I wanted. I think there’s a tendency today for people to stereotype gay men and while some of those creative and flamboyant qualities might ring true, we are more than that. There is as much diversity within the gay community as there is the heterosexual one. If I knew earlier all the options one has as a gay man, it would have made a difference to me in accepting myself earlier and in knowing that I’m not alone.AM: What is your favorite photograph in the book?SP: I think, having made a point of never leaving a shoot until I had a photograph or portrait worthy of being in a book, really makes them all favorites. I love them all. AM: Tell me what you want people to get out of this book. You mentioned your story, and obviously gay people who aren’t out themselves are going to get one thing out of it, but what about somebody who’s never met a gay person? AM: Tell us about your cover choice? SP: Up until this last year, having a uniformed gay soldier on the cover would not have been possible. Today it is, thanks to people like Dan. His stand against Don’t Ask Don’t Tell and the injustice that it is/was is admirable. He helped right such an incredible wrong that was the basis for so much hatred. When I shot him in his uniform out on that snow-covered street in Cambridge, I saw a man that was proud of all he was and all that he had accomplished and just happened to be gay. Like every man that is in the book. What the image does though is makes you take a second look. It made you question your preconceived beliefs on what a gay American is. AM: This book is a collection of essays in addition to a collection of portraits; each portrait coincides with an essay. Which should people look at first? SP: Each spread has one essay and one photograph. You can’t help but look at the photography first. And then you read the story. They are so beautifully written. I chose everyone for their stories, and once I started the ball rolling, I tried never to repeat something. Even now, after having familiarity with these stories for years, as I read them, they’re so honest, beautiful and powerful; they’re so emotional for me. Hopefully that will resonate with people, too, because it is the stories that I think are going to have the most effect. AM: Why the focus on every state? SP: It was a goal I set for myself. I said: fifty states, I have to go to them all. It became an obsession. I had done a lot of traveling before, but there were many states that I had never been to and I saw it as a great opportunity to see what gay life is really like, especially outside of the big cities. I think as a collection, it really proved to be fascinating. AM: Were there certain places that surprised you? Did you find somebody in Boston who you would have expected to see in Montana? SP: Oh, absolutely. You’d always get big cowboy types coming from real urban areas, or the Midwest, but there would also be the guys more typical of the area. In the West I got a lot of farmers and ranchers, and cowboys writing to me. I was always surprised to see who wrote. AM: Did any of the stories make you laugh out loud? SP: I think they made me cry more than anything. So many gay men have such a tough time growing up in our country. It’s not easy. Things are changing, there’s hope, but more often than not, it was giving men a great opportunity to tell their story. And a lot of them had hard stories to tell, or tough things to say. AM: What is it about this project that speaks to you as an artist? SP: It was a way to really push myself and my art; you show up and have the person that you’re going to be photographing with you the whole time, you have to engage them, keep them involved in the process without boring them, and move fast so that it can happen quickly. Usually two to three hours is what it takes me to do one of these shoots, so somebody has to dedicate a little bit of time to it. But I think the challenge is just never knowing what you’re walking into and really pushing yourself to try and get something to happen in front of the camera that is an insight into that person. AM: Was the choice to shoot these on the home turf of your subjects a storytelling choice or was it an artistic challenge choice on your part? SP: Both. To truly give viewers an honest glimpse into these men’s worlds, I felt that photographing in or near their homes was needed. SP: I think it’s needed in our time and culture. With what’s going on in our country with gay rights, the voting bloc, with issues being decided for us and how we live our lives, every one of us needs to do what we can to make life better. I think if more people did that and chose to take their love, and do something good with it, we’d make the world a better place. There needed to be a book that America could understand. I’ve become an unintentional activist with this project, and I think it’s a great thing. I think more people should do it if they can. AM: Do you think of your subjects as activists? SP: Many of them are, absolutely. Just by coming forward, they become activists, even if many of them never stepped foot in a gay and lesbian center, or marched in a parade, or wanted to change anybody’s opinion. They’re just living their lives out and proud and by doing so, they are in a position to change people’s minds. Appreciating the hard work you put into your blog and in depth information you present. It’s nice to come across a blog every once in a while that isn’t the same out of date rehashed material. Fantastic read! I’ve saved your site and I’m including your RSS feeds to my Google account. Thanks for the auspicious writeup. It in reality was a enjoyment account it. Look complex to more introduced agreeable from you! However, how could we communicate? A motivating discussion is definitely worth comment. I do believe that you need to publish more on this topic, it may not be a taboo subject but generally people do not talk about these topics. To the next! All the best! !